benghazi reports « THE BRYCE IS RIGHT! – The Democratic version versus the Republican. 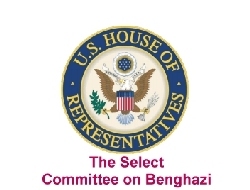 The official report on the Benghazi attack on September 11, 2012 was released by the House Select Committee on Benghazi on Tuesday, June 28, 2016. As the GOP controls the House, this lengthy report was predominantly written by House Republicans. To counter it, the Democratic minority issued their interpretation of the investigation on Monday, June 27th, as a preemptive strike. The two are substantially different. The Democratic version is 344 pages in length, while the official report is much more extensive as it also contains data and testimonies from the hearings. * The Defense Department could not have done anything differently on the night of the attacks that would have saved the lives of the four brave Americans killed in Benghazi, and although the military’s global posture prevented it from responding more quickly that night, improvements were made years ago. * The State Department’s security measures in Benghazi were woefully inadequate as a result of decisions made by officials in the Bureau of Diplomatic Security, but Secretary Clinton never personally denied any requests for additional security in Benghazi. * The Intelligence Community’s assessments evolved after the attacks as more information became available, but they were not influenced by political considerations. * Administration officials did not make intentionally misleading statements about the attacks, but instead relied on information they were provided at the time under fastmoving circumstances. Interestingly, Donald Trump’s name appears 23 times in the Democratic report, someone who had literally nothing to do with the incident. More than anything, the Democratic version condemns how the investigation was handled under Chairman Trey Gowdy. * Despite President Obama and Secretary of Defense Leon Panetta’s clear orders to deploy military assets, nothing was sent to Benghazi, and nothing was en route to Libya at the time the last two Americans were killed almost 8 hours after the attacks began. * A Fleet Antiterrorism Security Team (FAST) sat on a plane in Rota, Spain, for three hours, and changed in and out of their uniforms four times. * None of the relevant military forces met their required deployment timelines. * The Libyan forces that evacuated Americans from the CIA Annex to the Benghazi airport was not affiliated with any of the militias the CIA or State Department had developed a relationship with during the prior 18 months. Instead, it was comprised of former Qadhafi loyalists who the U.S. had helped remove from power during the Libyan revolution. * Five of the 10 action items from the 7:30 PM White House meeting referenced the video, but no direct link or solid evidence existed connecting the attacks in Benghazi and the video at the time the meeting took place. The last section of the report includes concluding comments from the principal writers of the report, Republicans Jim Jordan and Mike Pompeo. * Officials at the State Department, including Secretary Clinton, learned almost in real time that the attack in Benghazi was a terrorist attack. * The American people expect their government to make every effort to help those we put in harm’s way when they find themselves in trouble. The U.S. military never sent assets to help rescue those fighting in Benghazi and never made it into Libya with personnel during the attack. And, contrary to the administration’s claim that it could not have landed in Benghazi in time to help, the administration never directed men or machines into Benghazi. * Despite its claims, we saw no evidence that the administration held a sincere interest in helping the Committee find the truth about Benghazi. There is a time for politics and a time to set politics aside. A national tragedy is one of those times when as a nation we should join together to find the truth. That did not happen here. So while the investigation uncovered new information, we nonetheless end the Committee’s investigation without many of the facts, especially those involving the President and the White House, we were chartered to obtain. It is this last comment which hints at the political divisiveness of the committee. Whereas Democrats openly condemned their Republican counterparts for how the investigation was performed, the Republicans were stonewalled by the Obama administration in terms of releasing information. Bottom-line, the administration’s reaction to Benghazi was politicized as it occurred just two months before the presidential election. If the truth was known back then, the president would have likely not been re-elected. Hillary Clinton did, in fact, have a role to play in all of this, if nothing more than knowing the risks involved. It is unclear whether she deliberately issued a “stand down” order. In fact, this is an issue that doesn’t seem to have been resolved and if it is true, that no such order was issued by a ranking officer, than the military and administration are both guilty of gross incompetence. NEXT UP: IS THE NEWS CAUSING DEPRESSION? – Does it act like a drug? LAST TIME: THE INFORMATION CURTAIN – What can be done about the media’s distortion of the news?